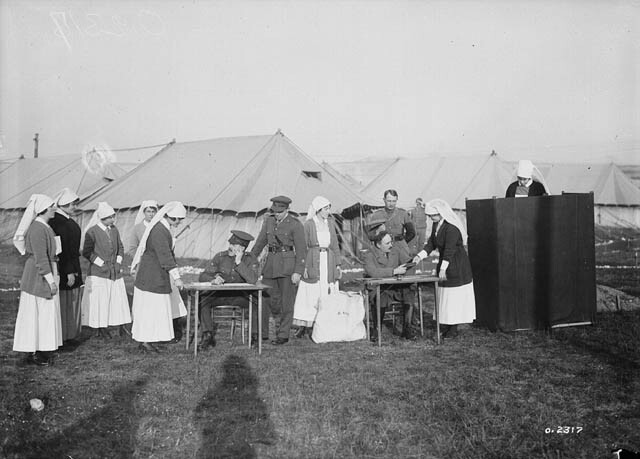 Canadian Nursing Sisters voting at a Canadian Hospital in France. December, 1917. Before the outbreak of the First World War (also known as the Great War) a hard-fought battle was already being waged by women in countries such as Canada, Great Britain and the United States of America. Although women in these countries were bound by their nation's respective laws, they were denied any direct voice in changing them. Those who supported the idea of women's suffrage (political franchise or the right to vote) were known as suffragists. The suffragettes, or female suffragists, of this era were unprecedentedly organized, vocal, and at times, disruptive in their efforts to protest the inequality that women faced. The large suffrage demonstrations and marches, characteristic of the first decade of the 20th century, declined with the upheaval of the Great War. Women, such as Albertan Nellie McClung, who were leaders in the fight for the franchise, became leaders in women's relief and voluntary organizations. As more men left for the battlefields, women successfully stepped into the breech in all manner of employment. It wasn't long before the disparity between women's obligations and rights became apparent. At the beginning of 1916, Manitoba led the way with the enfranchisement of women in Canada, followed next by Saskatchewan and then Alberta and British Columbia. This was a limited victory for Western Canadian women, however, for the enfranchisement applied only to provincial elections. The Western Canadian example was not enthusiastically adopted in other provinces. Provincial suffrage for women extended across Canada at a slow pace with many provinces not passing enfranchisement legislation until after the Great War. The last province to adopt legislation for provincial women's suffrage was Quebec in 1940 Footnote1. The franchise for women in federal elections was achieved, on the other hand, by the end of the Great War. The first step in legislating the federal franchise to women was reached in September 1917, when the Military Voters Act and the War-time Elections Act were given Royal Assent. The Military Voters Act, gave women on active military service, such as Nursing Sisters, the right to vote in federal elections. The War-time Elections Act, further extended the federal franchise to all women who were British subjects, over the age of 21 who were the, "wife, widow, mother, sister or daughter of any persons, male or female, living or dead" who was serving, or had served with the military forces. While the legislation gave the vote to more women in Canada than ever before, some believed that the Unionist government of Robert Borden only expanded the franchise so that new potential Unionist voters could be gained. On January 1, 1919, the franchise was further expanded to all non-Native Canadian women being British subjects and 21 years of age Footnote2. "Status Aboriginal women were excluded from political activities related to local Band governments until 1951, when amendments to the federal Indian Act removed barriers to women's right to vote or hold office in Bands. Aboriginal women were allowed to vote in federal elections in 1960, when Ottawa finally extended the franchise to all Aboriginal people, men and women." The Canadian Encyclopedia, Women's Suffrage.